Welcome to the sortfolio of InterDevil.com. We’re not an Agency, just a small group of Creative People based in Toronto, Canada. We build successful web sites and provide complete solutions to all kinds of businesses since 2003. We're small but have a huge focus on work, able to provide top-notch cutting edge solutions at fraction cost of the bigger guys in a shorter time-line. If you're an individual or business who is looking for professional web site, we're the ones to get in touch with. Our staff has over 10 years experience, always up to date with the most advanced and recent technologies. Feel free to look through our creative portfolio. We love to design and build websites. Contact us today, obligation free quote. 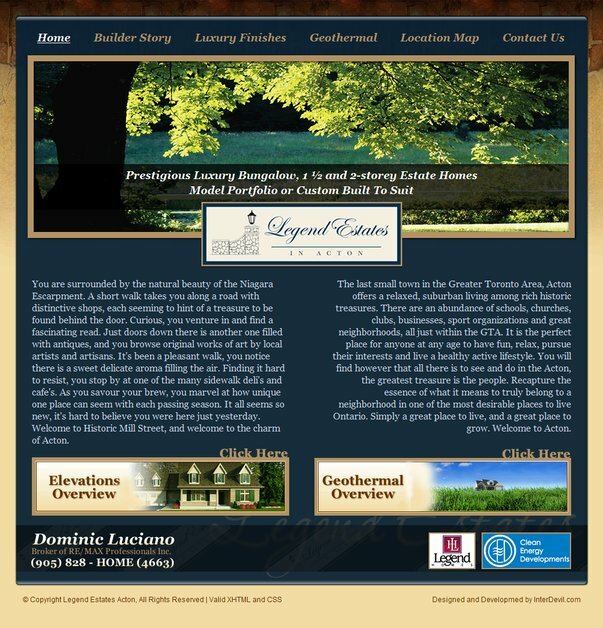 Here is an overview of the most recent design and development we did working with Legend Estate. We listened to client's ideas, understood their purpose and needs, sketched, crafted and built this wonderful website using XHTML 1.0, CSS 2.0 and Java Framework such as jQuery.